R. Gordon Kirk, Alan A. Kornhauser, John Sterling & Ali Alsaeed, 2007. 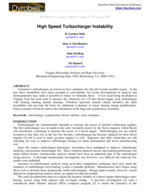 Automotive turbochargers are known to have operation into the self-excited unstable region. In the past these instabilities have been accepted as unavoidable, but recent developments in analysis and instrumentation may make it possible to reduce or eliminate them. A test stand being developed at Virginia Tech has been used to measure the vibrations of a 3.9 liter diesel engine stock turbocharger with floating bushing journal bearings. Vibration spectrum content clearly identifies the shaft instabilities and provides the basis for additional evaluation of future bearing design modifications. Future research will be devoted to the elimination of the large sub-synchronous excitation.